The first game of the evening saw bottom take on top as both sides were chasing an elusive three points. It was the Tigers who came out roaring as they piled on the opening four goals of the contest with Scott Rogan bagging a brace supported by strikes to Cosimo Russo & Jose Filho to have the game all but over very early on. Athletic weren’t laying down though and got two goals back very quickly with Simone Pelletti & Ben Grillo both finding the net to have their side back within two goals. 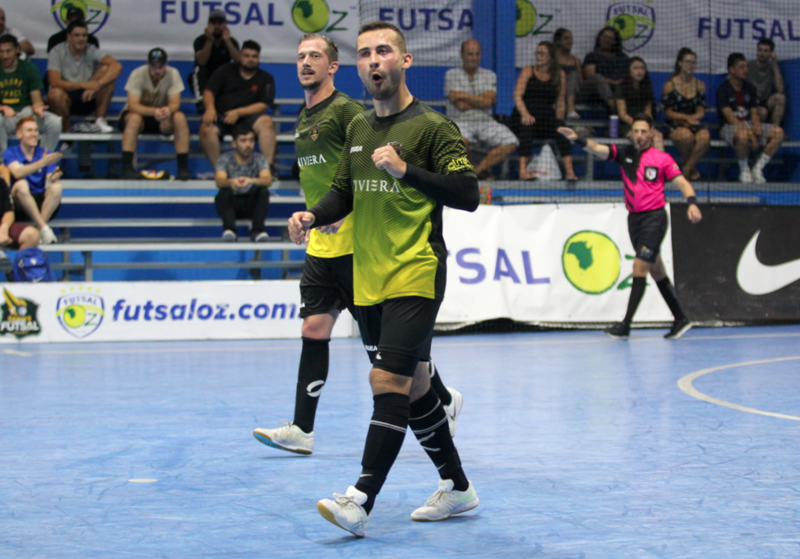 A late ten meter penalty went Fitzroy’s way as Fernando De Moraes stepped up and converted it to have the Tigers leading by five goals to two at the break. The second half was one way traffic for Fitzroy as they dominated the half from start to finish piling on eight unanswered goals as a second half hat trick from Filho saw him end the game with four goals to his name, while Ben Monteleone grabbed a second half hat trick and singles from Russo, El Hayek & Parthimos sealed a commanding win for the Tigers. 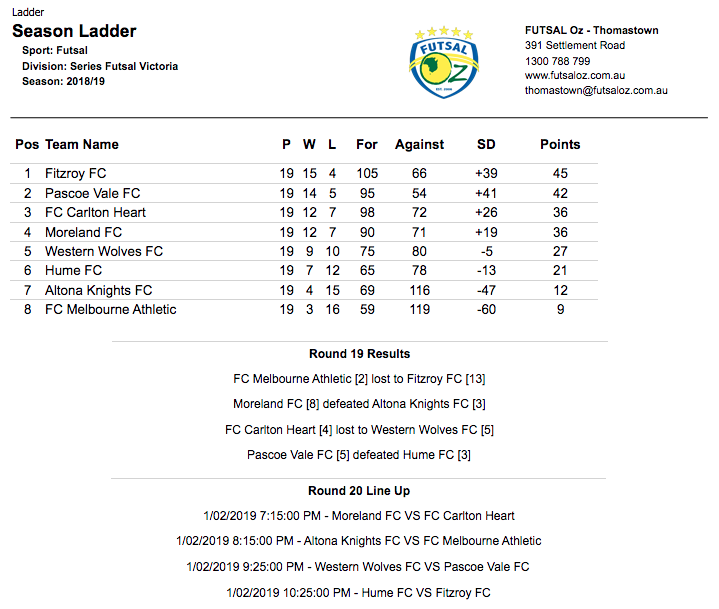 Next up saw Moreland who were chasing a Series Futsal Australia place, face Altona Knights who knew a win would have them all but safe. The Blues struck first through a fortunate bit of play as an own goal handed them the lead, before some lovely feet from Atay Ibrahim set up Abdirahman Ahmed to double the advantage. Abdirahman was feeling it this evening and got his second of the game as the ball had just crossed the line for a 3-0 lead. Altona would pull a goal back through Camilo Marin to remain a chance at a comeback at the half time break trailing by two goals. Early in the second half Altona fired another goal back as Hicham Nehfaoui netted to have the Knights back within a goal. Moreland could breathe a little easier as Ruz Roslan smashed an effort home to restore the two goal advantage, before Adam Cooper beat his man down the line before firing through the legs of Frano Saric to all but seal the points. The game had opened up for the Blues and they were feeling a lot more comfortable which lead to them getting their sixth of the contest when Atay Ibrahim smashed home another effort. Some more good play from Moreland saw Jordan Constan tap home to make it a 7-3 lead. 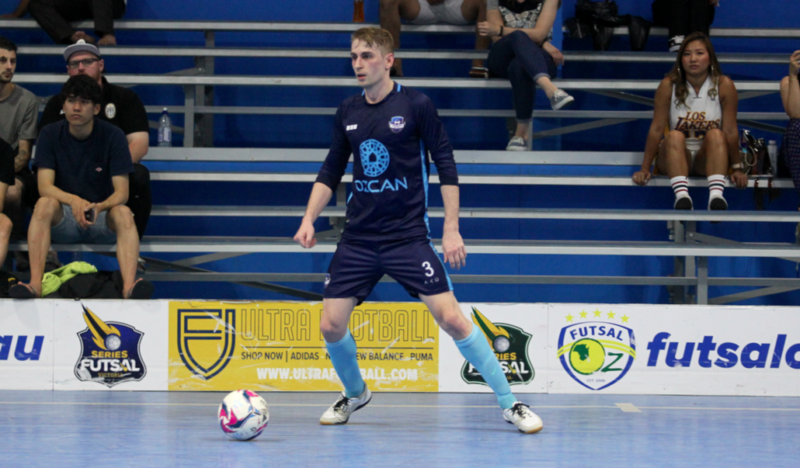 Simon Menichelli pulled a goal back for the Knights to keep them in the contest, but the game was done as Abdirahman completed his hat trick to seal a win for Moreland as they look to lock up a top three birth. 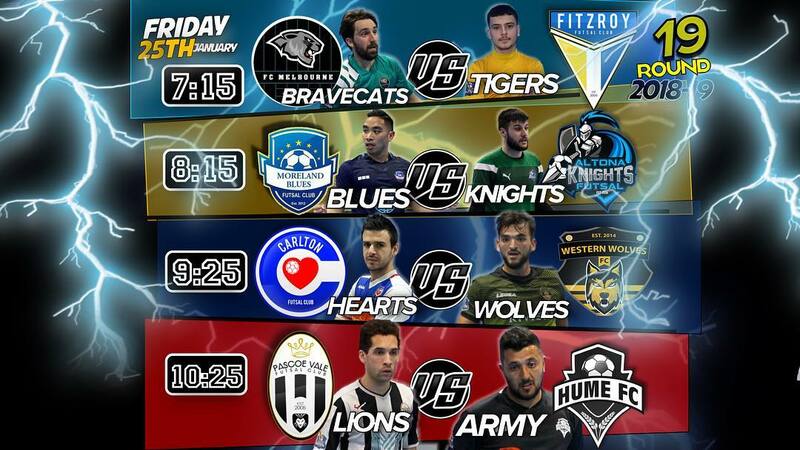 Next up saw Carlton Heart who were chasing a top three finish take on Western Wolves who knew a win would secure their place in Series Futsal Victoria for the 2019 season. It was the Wolves who struck first through a Ubeyde Cicek free kick, before Carlton got back on level terms as Ernie Simsek found the net. Peter Tamburrino came a long way out but Cicek won possession and found an empty net to have the Wolves leading at the break. Early in the second half Cicek would emulate his first half free kick, completing his hat trick to open up a two goal advantage, before a ball through the middle was tapped in by Daniel Aliano for his first senior goal in Carlton colours to keep his side in the contest. Another free kick was executed by the Wolves as Mo Rahimi converted at the back post. Carlton hit back almost immediately as Dylan Govic got his first goal of the season picking out the top corner, before a lovely throw from Tamburrino found Chaaban Rajab who tied the game with thirty seconds to play. 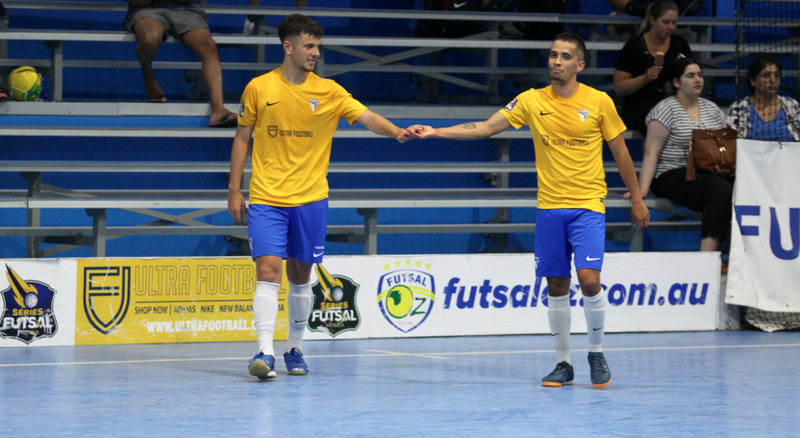 From the resulting kick off Rahimi would break Carlton Hearts as he beat his man and picked out the top corner to seal the win for the Wolves and with it hold their place in Series Futsal Victoria for another season. The final game of the night saw Pascoe Vale looking to remain in the title race, take on Hume who were already resigned to a relegation playoff. It was the lions who struck first through a well worked move that saw Joao Da Silva tap home, before Hume drew level thanks to a good set piece that was tapped in by Resit Culculoglu. A free kick soon after was put away by Moe Matar to give Hume the lead, only for it to be overturned by a second Joao Da Silva goal and a first to Andre Caro to have the Lions leading at the break 3-2. Early in the second half Hume would pull themselves level again as the initial effort was saved, before Joao Da Silva put it home for an own goal to square the game at three. Henrique Fernandes-Pimenta climbed off the bench and found the net to restore the Pascoe Vale lead, before Alisson Lima Da Rosa found himself one on one as he converted to seal the points, with the win only soured by a late red card to Lucas Vaz but they remain in the title hunt.